Notions: Lace, hooks and eyes. How historically accurate is it? The pattern is correct. Using a sewing machine is correct. However, I should have lined the skirt (it would have helped a lot from it riding up on the hoop constantly! gah!) so, eh. Hours to complete: The research was the worst part of this one. That was a good two days! The outfit itself only took maybe 5 or so hours. Total cost: I think I paid $20 for the fabric many MANY years ago. I'm destashing. The lace was some lace someone gave me. First, read here on my investigation into what the heck I'm wearing. :-) I originally thought that there must be something "political" about the Swiss in the early 1860's to get the name. However, it turns out, it might just be re-enactor politics instead. The Swiss Bodice in period was a little girl's garment that laced up the front - not the thing I'm wearing. Instead, this, it turns out, was called a corsage. I have no idea why we call it a Swiss waist today when they clearly didn't in period. My only guess is that someone - probably back in the 1960's which is wear all bad terms seem to come from for all re-enactor type circles (SCA, CWA, ect)- declared that they were wearing a Swiss waist and no one ever questioned it because the person wearing said garment was an "authority" on such matters. I've seen it happen -and accidentally done so myself- many, many times. It's how the eye twitching "but purple is only for royalty" got started. 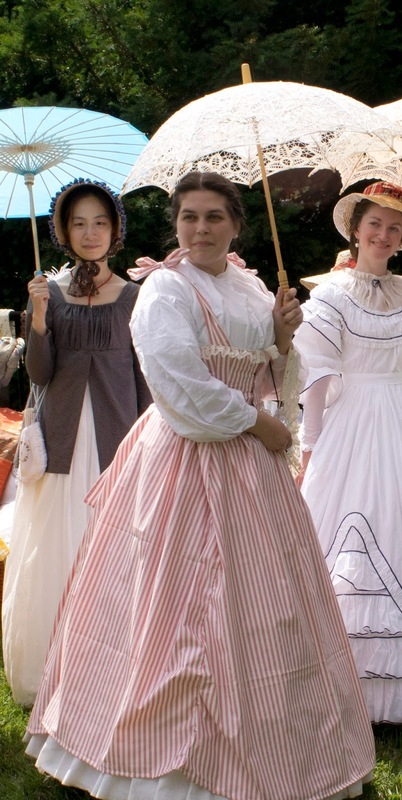 However, the dress I'm wearing also shows a bit of the politics of the 1860's. The 1860's was a time of war. Not only did we have the American Civil War; the second Opium war had just ended in 1860, France took over Mexico in 1863 because they could, Italy was in shambles, all of South America was at war, and New Zealand had it's own issues to worry about as well. ...and that's just to name a few. Basically, the world was a mess at the end of the 1850's/start of the 1860's. This, of course, affected trade. The American South's entire cotton distribution was vastly disrupted. Importing it from India - which was under reconstruction via the Brits at the time- was going to be outrageous. So to have cotton at all showed that either I re-made an old dress or I had some money. This is why so many dresses from the early 1860's are just remade 1850's pieces - you had to because it was next to impossible to buy cloth to make clothing unless you had some money. The cloth itself speaks to the politics of the era.